According to reports from experts such as the World Economic Forum, natural disasters and other extreme weather incidents are expected to increase in intensity not only throughout 2018, but in the future as well. In fact, the World Economic Forum recently issued its 2018 Global Risks Report that shined a spotlight on how environmental disasters are one of the largest risks facing every major industry this year, including the water and wastewater treatment industries. The findings in the latest report were determined by surveying nearly 1,000 experts across the globe and asking them about their beliefs on the biggest risks facing our planet. There was a consensus among the respondents that the earth is preparing to enter a “critical period of intensified risks in 2018,” according to the report. From tornadoes and earthquakes to wildfires, hurricanes, and tsunamis, natural disasters have a history of wreaking havoc on communities and even entire countries. But what environmental risks are most likely to occur in 2018 and beyond? The experts showcased in the report prioritized several different global risks based on the impact and likelihood of an event occurring. Of those global risks, five environmental factors were ranked exceptionally high. Of these five environmental risks, extreme weather has been named the biggest risk to the Earth for 2018, and that very news should intrigue every water and wastewater treatment facility leader out there because of the implications extreme weather can have on a facility and its equipment. When extreme weather strikes, the last thing anyone wants is for the local treatment facility to go down. However, the truth of the matter is that extreme storms such as blizzards and hurricanes have the potential to damage the operation and function of water and wastewater treatment equipment and infrastructure. That said, as extreme weather continues to become more frequent, it would be wise for water and wastewater treatment management teams to begin figuring out ways to make their plants more resilient. This takes time, careful planning, and money for facility upgrades. Protecting critical field equipment from major weather events can make a dramatic difference in the proper functioning of municipal facilities. While everyone expects traffic congestion, travel delays, and school closures during the multiple nor’easters that have pummeled the East Coast of the U.S., they still want water to flow from their sinks and toilets to flush away wastewater properly. If the equipment in neighborhood lift stations is properly protected by a building specifically engineered to handle heavy snow loads and properly insulated against below-freezing temperatures, the people in that neighborhood have a better chance of making it through those storms with much less frustration or sense of inconvenience. 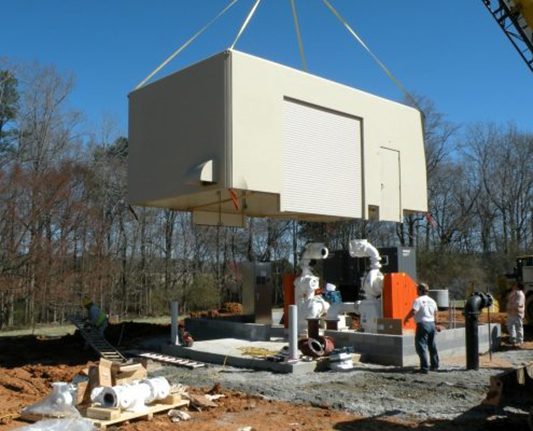 If chlorination stations or sludge dewatering enclosures are engineered to withstand the ever-increasing storms carrying hurricane-force winds that continue to batter coastal Florida, local city waterworks can continue to operate smoothly despite these rising extreme weather events. One of the most common issues treatment plants run into during an extreme weather event is a loss of power. When this happens, facilities are forced to count on emergency generators. What happens when generators fail, though? Well, we only have to look at a recent 2013 incident to know how catastrophic a power failure can be for a treatment plant. In February 2013, extreme weather contributed to a generator failure near East Providence, RI. The resulting chaos was more than 600,000 gallons of raw sewage being discharged. That incident has prompted many in the industry to begin developing plans to help facilities be more resilient in the face of the most extreme weather. Today, industry leaders know that facilities need to be able to not only keep their equipment safe from the elements, but also that facilities need to devise ways to minimize storm damage, recover quickly, and continue to provide service. One way leaders can make this a reality is by implementing mitigation measures in the form of emergency plans, equipment upgrades, and better equipment protection. To avoid a debacle like the one that took place in Rhode Island, every water and wastewater treatment plant should be outfitted with upgrades and proper protection so they can function under any type of extreme weather event. When facilities shut down unexpectedly, as happened in Rhode Island, the resulting sewage leaks can threaten the health and environment of the surrounding community, including citizens. 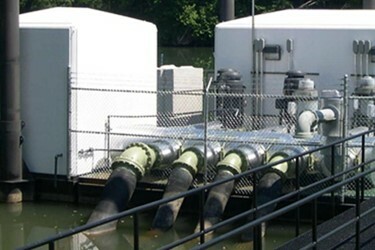 Fortunately, many water and wastewater treatment facilities already have emergency plans and precautions in place, but there is always room for improvement. If storm systems continue to increase in severity, facility infrastructure will have to be improved, and other mitigation measures will be a must-have. Leaders will have to begin preparing and planning for not only power outages, but also flooding, equipment failures and damage, and more. Combine that with the fact that many water and wastewater treatment plants are already positioned in vulnerable areas near bodies of water, and the risk of flooding from climate change and storm surges will only continue to grow. In addition to having effective response plans in place, facility leaders and operators should check fuel tank levels frequently. The last problem you want to run into during a storm is a lack of fuel to keep your generators running. In the case of many severe weather events, operators and facility personnel should essentially plan on not being able to access the services of fuel distributors until storms pass. Because of this, careful planning should be dedicated to ensuring the facility has enough fuel on hand to make it through any type of storm. If the facility doesn't have enough on hand, take proactive steps to bring in more before a storm hits. At the end of the day, planning is key. It's important to note, however, that all the planning in the world won't mean a thing if communication is lacking. It's always important that facility personnel know who to contact in an emergency. All water and wastewater treatment personnel should be aware of any plans in place for when an extreme weather event does occur. In fact, before a major storm hits, all staff members should meet regularly to discuss the plan of action, mitigation plans, individual responsibilities, and any contingencies. You should always hope for the best, but plan for the worse. Communication is key during extreme weather events, and it helps ensure everyone stays on track. Whether it's taking proactive steps to secure any essential equipment, investing in easy-to-install equipment shelters designed to withstand extreme weather conditions, or implementing emergency operating plans, preparing for extreme weather before it happens is the best thing industry leaders and facility operators can do to safeguard against the next catastrophe. Tracy Switzer is Founding Principal and President of Shelter Works, a manufacturer of custom fiberglass enclosures and buildings designed to protect utility equipment. The company has over 22 years of experience in designing and manufacturing fiberglass buildings, using state-of-the-art technology and premium composite materials. These fiberglass buildings are put through independent lab testing to ensure they can withstand the most extreme conditions and perform for the long-term.